Hi again! 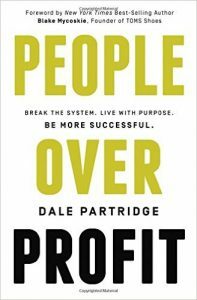 Our awesome intern Nate is here to bring you his unbiased review of a very unique book: People over Profit, authored by Dale Partridge. Want to find out what it means to put people over profit? You may already know it, but might not know what’s behind it – so enjoy the write-up! People over Profit is an easy and worthwhile read, though it does border a little on the far-fetched. The book is definitely addressed to entrepreneurs, but even if you aren’t planning on starting a business, author Dale Partridge has some great insights on our culture of consumerism, as well as what makes healthy culture in business. Anyone can point out flaws, but Dale goes a step further and aims to present the reader with alternatives to the destructive life cycles of companies (as he sees them). Partridge begins by suggesting that the system is broken. What system? All of them! In the world Partridge inhabits, systems touching everything from healthcare to automotive production to fast food are inefficient, and worse, operating at the expense of the people who make them run. Partridge then lays out what he terms “The 4 Eras of Organizational Behavior” – The Honest Era, The Efficient Era, The Deceptive Era, and The Apologetic Era. He argues that most companies – even the ones that we now look at as corrupt or dishonest – started out as good companies with a focus on quality and caring for customers. Partridge uses McDonald’s, Ford, and Wal-Mart as three case studies to illustrate his point. After dissecting the current cycle, he begins to cast vision for a better way. He suggests that it is possible for a company to stick with the same, quality ethos – his defines this as a culture where people are placed over profit – throughout different generations of leadership. To Partridge, Patagonia, REI, and Chick-Fil-A show the business world how this is possible. Sevenly, the company Partridge co-founded, is referenced throughout the entire book, and he uses Sevenly’s ideals of paying designers nearly twice the going rate and donating a little less than half of all profit to a different charity every week as the basis for the new system that he wants to see invade the corporate world. I was intrigued with the history and evolution of Walmart, McDonald’s and Ford. Partridge writes that Ford was one of the first companies to introduce the 40 hour work week, as opposed to a 70 or 80 hour work week. Henry Ford’s son was one of the first leaders in industry to recognize that the American man needed more than a single day for rest and recreation. Thus America’s two day weekends began. The work environments that now seem so hostile and restrictive were, at their conception, a profound and favorable change to the insane working conditions of the industrial revolution. Ford was not only on the cutting edge of quality products, but also quality of life. Wal-mart started as Sam Walton’s dream to create more shopping options for people in rural towns. But when the company began sourcing shelf items from overseas mass producers, its low prices drove mom-and-pop stores with higher quality and higher priced products straight out of business. McDonald’s original mission was to use real, locally-sourced ingredients to bring its customers fast, ethical, and affordable food options. Now they are anything but that. Instead of using quality, locally sourced ingredients, they have sacrificed all quality for cost saving. Cutting cost is good, but not if you aren’t delivering on your promise to your customer base. Their mission augmented, instead of making efforts to maintain their original (and achievable) goal, they adjusted their goals to fit the most convenient course of action. As a result they have become a cultural reference for low-quality products and poor customer service. One aspect of the book that I found strangely refreshing are the chapters “Truth Wins” and “Transparency Frees.” This concept seems so foreign in our culture, where it is acceptable to protect people from harsh truths, to shield kids from the harsh realities of life, and to avoid embarrassing details to save face. Dale faces this dilemma head on. He essentially says that the only information that shouldn’t be openly available in a company are trade secrets, such as KFC’s secret fried chicken recipe. But information like salaries should be public information. I think that this is an interesting concept, and even though it is probably the most unrealistic action proposed in the book, in all reality, a company couldn’t really stay, permanently, in the so called “Honest Era” unless they were a complete open book to the public. One of my favorite sections of the book is “Own your Failures.” It is barely more than a header, but it is definitely not a common trait in many business leaders we see today. He proposes that we can’t grow as people and entrepreneurs unless we admit that we have room to grow. Dale leads the way by pointing out a few shortcomings of his own. I thoroughly enjoyed the book, and would recommend it to anyone who has any aspirations of entrepreneurialism. However, I will say that it sounds a bit naïve at times and ends on a major self-defeating note, as the last chapter is all about how Dale was fired as CEO of Sevenly, his own company. In fact, he implies that Sevenly may already be leaving the “Honest Era” of organizational behavior and entering the “Efficient Era.” I was a little disappointed when the poster-child company of his new revolution of “people over profit” rolled over and started down the long road of so many companies before it. But, quite frankly, the point of a business is to make money, so can we really be surprised when leadership pursues efficiency at the expense of all else? The ending does not completely undermine the entire book, but it definitely does not reaffirm its message. Get your copy of People over Profit today.